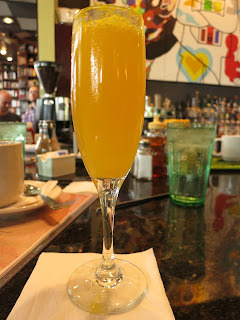 Busboys & Poets continues to be one of the hottest spots for brunch in DC. I almost never go out for brunch mostly because by noon, I'm really in the mood for lunch. But, if I do go out, I'll either go to Muse, which offers the only all-vegan brunch in the city, or I'll go to places that actually offer some lunch items. And because most restaurants in DC have a special brunch menu until at least 3 p.m., that means nothing but breakfast items until dinner. Not cool. So, on this rare occasion, Zach and I went to Busboys because they just came out with a couple new vegan lunch options on their menu that are available during brunch. Well, needless to say, when we arrived at 11:30 a.m. on a Sunday, it was packed, as usual. There were many people already on the waiting list and I was really disappointed to find out there was an hour-long wait. Ugh. Busboys & Poets also houses a bookstore so those waiting can peruse the books, which makes it a little better, but we were hungry and not in the mood to peruse. So, we started scouting the bar. I noticed that there was an open stool and took a seat and soon thereafter someone left and voila! within 15 minutes, we had seats at the bar. It wasn't exactly what we had wanted, but it was better than an hour-long wait, that's for sure! 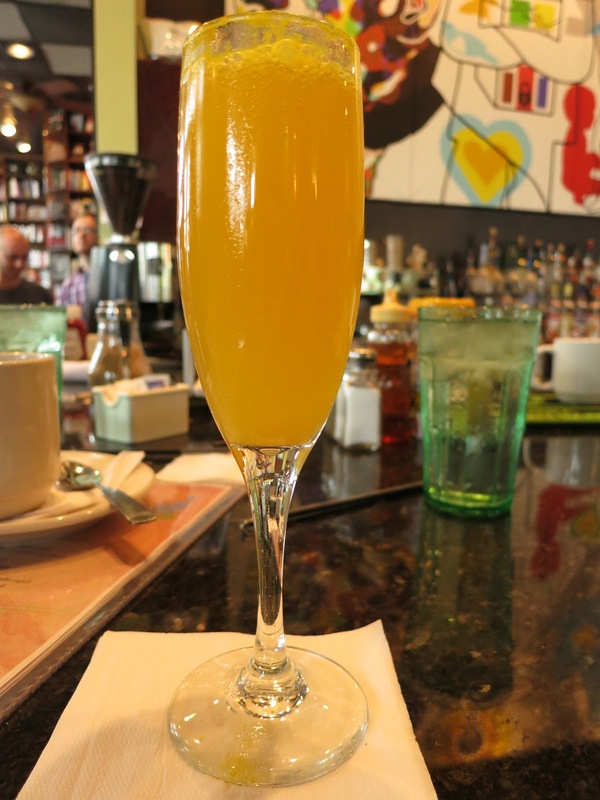 I immediately ordered a mimosa, which was pretty disappointing. It was incredibly watered down. I returned it for my staple drink -- the pomegranate lemonade, which is always good. During brunch, breakfast and sandwiches are available while appetizers, pizza, and entrees are not. Well, at least they offer the lunch sandwiches so I can't complain too much. As I mentioned, there is a new-ish sandwich on the menu - a vegan tuna salad that was particularly intriguing so I ordered that along with a mixed greens salad. The artwork and the patrons are eclectic. Busboys is said to attract one of the most diverse set of patrons of any cafe in DC as it is owned by a peace activist. There are poetry readings, book signings, and political speakers on a regular basis. After a while, our food was served. I absolutely loved my vegan tuna salad sandwich! The "tuna" was made of chickpeas with relish, nori, carrot, celery, red onion, and vegan mayo. It was served on toasted French bread with lettuce and tomato. It didn't taste like tuna, but had a similar consistency and a rich, delicious chickpeaish taste. Now, I'll have to decide between my all-time favorite, the tempeh sandwich, and this one on each visit. But, it is good to have options! Zach also ordered a side of the vegan sausage. They decided to bring him pig sausage instead. Thanks. I took one look at it and asked if it was vegan. They confirmed it was not and brought the right one out. That said, the vegan sausage was really good. It was thick and incredibly flavorful. They said they didn't make it in-house so I wonder which brand it is. Hmmm. When we were paying our check, they finally called out my name. Yeah, I guess it really was an hour-long wait. I was happy that we found a seat at the bar and ecstatic that there was a new vegan sandwich available. Busboys has great food, prices, and atmosphere. Now, if only they'd take reservations, they'd be perfect. Click to see my previous review from February 28, 2012.